I’ve been working in the ICT industry for more than three years now and my experience shows the sector presents tremendous opportunities for women. However, for women to seize these opportunities, gender stereotypes and biases that prevent them from pursuing bigger things must be addressed. At each APNIC conference, there is a dedicated session for women in ICT. 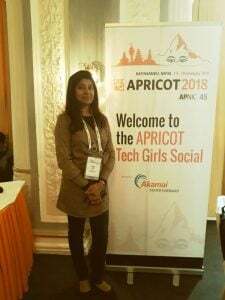 I have been privileged enough to attend three APNIC conferences, and Women in ICT sessions. At each session, we discussed the struggles of women in ICT; the roadblocks and obstacles are reiterated frequently. People attend the sessions, share their stories, and propose solutions but we see no real-life implementation of the discussions. What’s the benefit of having such sessions if we can’t make the changes that can impact the entire community in a positive way? What is the point if the voice of women gets heard only twice in a year and remains unheard after formalities end? The conversations of women in ICT need to fly beyond conference rooms. Having that in mind, a small group of community members — Shaila Sharmin, Izumi Okutani and I — decided to ask the APNIC Executive Council (EC) to have a dedicated mailing list for Women in ICT with the mission to ‘support and encourage greater numbers of diverse female leaders in the Internet technology sector in the Asia Pacific who are able to fully contribute to a strong and healthy Asia Pacific Internet community’. After securing the APNIC EC’s support of the proposal, which we did at APRICOT 2018 in Kathmandu, we — with the support of the APNIC Secretariat — worked together on opening the mailing list. Today we are delighted and proud to announce the official launch of the ‘APAC-ICT-Women’ mailing list, dedicated to women working in the Asia Pacific region’s ICT industry. Anyone is welcome to join the mailing list but participants are encouraged to share information and opportunities relevant to diversity in the region. Increase female participation in a range of community activities including speaking engagements, program committees, fellowships, community trainers, policy making and discussion, and more. Build technical and leadership capacity in women in the Asia Pacific by sharing best practices, experiences and other resources. Facilitate professional networking in the Asia Pacific including continuing the conversations begun, and strengthen the connections made, at Women in ICT and Tech Girls events. To be the part of APAC-ICT-Women, please subscribe here. Let’s make every woman count in the ICT industry and be each other’s voice to accompany the change.